Misty's May Day Twister was Misty II's sixth foal and born on the Allens' farm in Manheim, Pennsylvania. Her sire is Misty's Sunpiper a descendant of Misty II's half sister Breezy. Sunpiper and Misty II were not that closely related and had some very fine traits so they were allowed to be bred together. 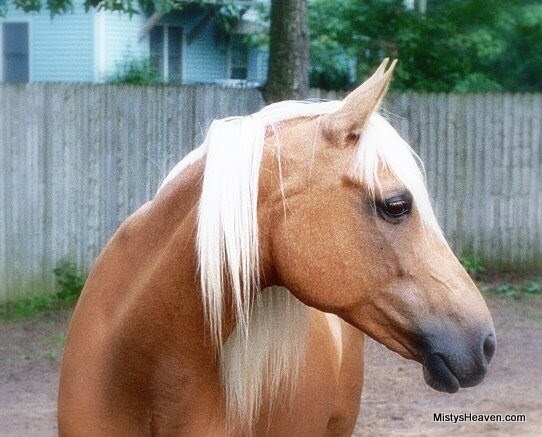 Twister greatly resembles her father, sporting a beautiful palomino coat. She has the markings of a white tornado in her blaze, hence her name. Since there was already a Twister in the Misty line, the Allens added "May Day" onto her name, honoring the day she was born. Twister was gentled to ride by the Allen children to be a hunter pony. She proved to be a winner in English pleasure classes. Twister is also a member of the Chincoteague Drill Team. Like her father, Twister also had training in dressage. 1996 marked the anniversary of the book Misty of Chincoteague. To commemorate this occasion, Breyer Animal Creations created models of Twister along with Misty II and her half sister, Black Mist. The three ponies also attended Breyerfest the same year and performed for the crowds, striking the famous pose on the stepstools. Twister often wore her special Breyer blanket for public apperances. Unlike other Misty family mares Twister was difficult to breed. For one reason or another she always had a problem with the stallion and the Allens wondered if she would ever have a foal. Finally in 2005 Twister had her first foal, a chestnut pinto filly named Misty's Heart of the Storm that was sired by Island Wildfire. Twister's other two foals took after her a great deal in color and looks. In May 2007 Twister had her second foal a palomino colt named Misty's Sunfire sired by Cezanne. Twister's next foal was born in 2010 and was a lookalike palomino filly named Twist O' Mist sired by Tuffer Than Leather. Her last foal was a chestnut colt named Misty's Stormy Eclipse sired by Cezanne. Like her famous mother and sister, Twister has been the subject of many forms of media. Nancy Hogan Armour did a painting of her, Black Mist, and Misty II, and she was also featured in the book Misty's Heart of the Storm by Kendy Allen that was released in 2006. A Cat's Meow piece was made from a photo of Twister and Heart of the Storm, which is only available on Chincoteague. Since the opening of the Chincoteague Pony Centre in 2000 Twister spent summers on Chincoteague performing for the visitors. Twister passed away in spring 2016 and was buried at her home farm Kerkaken Acres. She was the last living Misty family pony to have a Breyer model.